Kanji alive was originally created at the University of Chicago in 2001-2005 under the direction of Harumi Hibino Lory, with the assistance of Arno Bosse, Michael Erlewine, Russell Horton, Mika Ishino, Justin Jesty, Irene Kimbara, Aiko Kojima, Junko Nishimura, Shunsuke Nozawa, Justin Rounds, Robert Voyer, Keiko Yoshimura and with support from the University of Chicago’s Regenstein Library Digital Library Development Center (DLDC), Information Technology Services (ITS), and the ARTFL Project. In addition, we would like to thank Jenny Adams, Fritz Anderson, Sarah Arehart, Cornelia Bailey, Charles Blair, Simrit Dhesi, Ted Foss, Eric Ginsburg, Kaylea Hascall, Don Harper, Guillaume Iacino, Tanya Gray Jones, Chad Kainz, Gus Lacy, the late Karen Landahl, Roberto Marques, Dale Mertes, Mark Olsen and Matt Wilcoxson for their generous assistance. The 2008 version was created with the assistance of Arthur Christoph, Matthieu Felt, Camelia Nakagawara and Peter Thorson. Current Kanji alive web app UI design by Arno Bosse. We would like to extend our gratitude to Coji Morishita (M+ Fonts), Yasuyuki Nemoto (Kenkyusha Co., Ltd.), and Makoto Watanabe (http://mojimoji.de) for their generous assistance with the current version of Kanji alive. Above all, we would like to express our thanks to our tireless software developer, Joshua Day. In 2003 Kanji alive received the George B. Walsh Award for “Innovative Computing in the Humanities” from the Division of the Humanities at the University of Chicago. At the University of Chicago, Kanji alive has been financially supported by the Center for Teaching and Learning, the Provost’s Program for Academic Technology Innovation, the Center for East Asian Studies and the Consortium for Foreign Language Teaching and Learning. In addition, Kanji alive has also received support from US Department of Education Title VI funds. Mnemonic hints and associated graphics developed by Harumi Hibino Lory and Camelia Nakagawara for Kanji alive, based on: Kanji 2001 by Rev. Joseph DeRoo, 1980 Bonjinsha, used with permission. Entry number for each kanji in: Jack Halpern, The Kodansha Kanji Learner’s Dictionary, 1st ed. 1999, Kodansha, used with permission. Character number for each kanji in: Andrew N. Nelson, The Original Modern Reader’s Japanese-English Character Dictionary: Classic Edition, 2nd. ed. (1974), Tuttle Publishing, used with permission. Web links to kanji in the Luminous Japanese-English online dictionary, Kenkyusha, used with permission. Images of the 1235 kanji characters supported by Kanji alive using the DynaComWare, Screen and Morisawa fonts listed above were purchased from mojimoji.de. Images of the 1235 kanji using the “Kanteiryu” font are used with permission from Morisawa via Typesquare. Japanese Radicals under the terms of an Apache 2.0 license from Adobe Systems Inc. 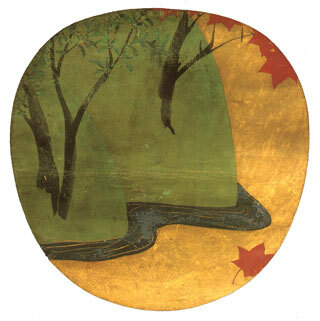 Maple Leaves and Flowing Water, River Tatsuta – Ogata Kōrin. Used with the permission of the Gotoh Museum in Tokyo. Any other use or reproduction prohibited without the explicit consent of the Gotoh Museum.